One day a while back I got antsy. Bored with my routine I took my camera and my cellphone and left for a walk with the dog. If you have a dog and you don't walk them, they get antsy too. More importantly you're missing a great chance to bond with your dog. They will benefit from it and you will benefit more. So Rack and I left. I just couldn't stare at the picture of Rio de Janerio on my wall any more that morning. Looking out the right through the bougainvillea and the Spanish Moss wasn't helping either. It was still early and I had been up even earlier. The house was otherwise quiet so why not go out and disturb the neighborhood by exploring? Walking through, I eventually ended up at M.E. DePalma Park and took a bazillion pictures. Or maybe about 100 pictures. I do that sort of thing. Take the camera, annoy people who could be there or elsewhere, and take pictures. Most of those pictures get deleted. Out of focus, finger on the lens, subject matter uninteresting. Who knows. Every so often there is a picture that talks to you. Perhaps Screams At You would be a better description. 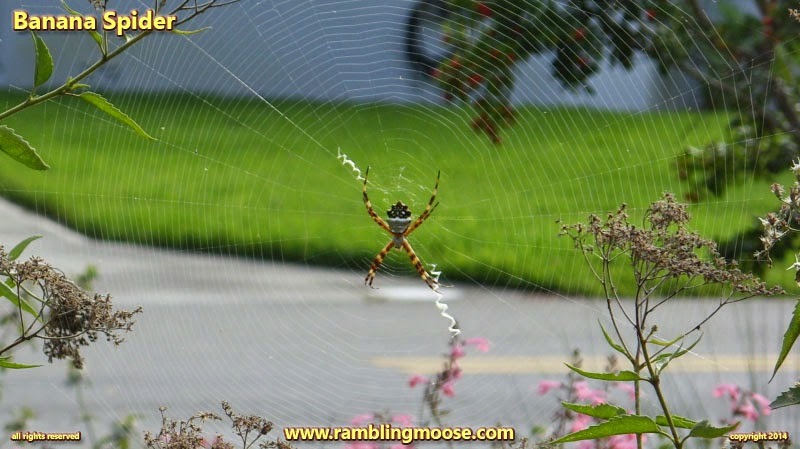 There was a banana spider on a web near the street. The street was a distraction, but that could be cropped. After having looked at it for two months, literally, I started playing with it and ended up with this result. Sure, there are stories of people getting totally freaked out by spiders. Whole movies made with Arachnophobia as the title. Forgetting that they're beneficial insects, these people would eradicate them the same way I would have eradicated mosquitoes. Just because. The birds and spiders would eat something else if mosquitoes weren't there. Really. Lets build a dome over Springfield and kill the mosquitoes. Please, Marge, Can We? But this spider. Horn Rimmed Glasses colored legs. Designed and patterned carapace that wouldn't be out of place in an art museum or a fabric pattern. I know people think they're ridiculous and huge and scary. I never felt that. They have their own natural beauty and belong here. They were here first after all. Playing with the picture I found a proper "HD" framed size and saved it off. I may have to master a DVD some day that this would work as a title card. I could also slap it in the middle of a video as a frame and have people confused why there was a subliminal spider in their family video. Who knows. Don't care. It's now probably dead and my memory, and now yours, are all we have left of it. It's now in my backgrounds directory and randomly will end up on my desktop for 10 minutes at a time. I like the picture that I got. Some won't, but that won't matter since it is here. Like I say about this blog: "You get what you pay for". So have a spider. Or Don't.